Stephen Ramirez IDs birds. Photo by Lance Jones. 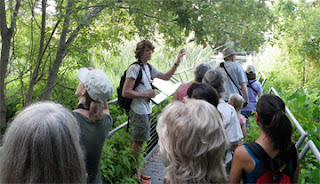 Stephen Ramirez’ September tour of Spring Lake was a great opportunity to see both birds and the area around Spring Lake. Twenty-two birders turned out, with all ages and levels of birding experience represented! Be sure to visit Stephen’s blog, where you’ll find links to information about the many birds spotted on the hike: over 30 species in all!